I recently came across an article (see picture below from SquashClub.org) about some enterprising chap in the US (where else) building his own outdoor squash court. His main reason for doing it was that he loved squash but hated to be indoors playing the game when the weather outside was warm and sunny. In the winter, of course, Vermont (where the court was built) can get up to ten feet of snow and experience temperatures of 22 degrees Fahrenheit meaning that – well, I suppose, he would have to revert to playing squash indoors like the rest of us. The squash court design was imaginative to say the least, with no roof, a 4 foot high back wall, and a slightly sloping floor allowing rainwater to drain through two holes in the front corners. There was also 5 foot high netting around the court to catch balls hit out of court so players wouldn’t have to scour the surrounding area looking for them! But it was the fact that the front wall was built facing North – to avoid having to play into the sun – which brought back memories of my own experience playing in unusual lighting conditions. 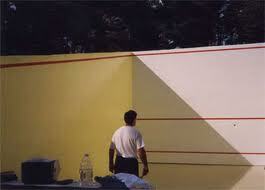 Or, more specifically, memories of when I used to play squash in a farmyard. Well, not in a farmyard exactly but in a purpose built squash court – complete with entrance lobby and viewing gallery – located in a farmyard. Now, I’m not exactly sure whether the farmyard was already there when the court was built or whether the farmyard developed around the court. But it certainly was there (in East Hertfordshire, UK as a matter of fact) and it certainly was playable. With one small limitation. There was no electrical supply to the court lighting. However, there was a skylight which was both undamaged and clean enough (on a sunny day) to let in enough light to brighten up the squash court. The challenging playing conditions, of course, demanded flexibility of thought and movement from both players – as well as extremely good eyesight. As the sun moved across the sky or went behind a cloud, the nature of the on-court light could change, sometimes instantaneously, from dazzling brilliance (depending on the time of year) to Stygian gloom. The changing visibility also provided an incentive for squash players to improvise shots which would be less effective in normal lighting conditions. The lob into the sun, for example. The drop-shot into the shadows which could suddenly appear in one of the front corners. And even the cross-court drive into the darker part of the squash court from the lighter – or vice versa. There was even a slightly damp patch in the back right hand corner which had a somewhat deadening effect on a ball of good length. All of which could even up a match as players of different standards adapted (or indeed didn’t) to fit the unique environment – rather like finches evolving on an island in the Galapagos. Well, as far as I know, the squash court’s still there although I don’t know whether a new breed of squash players in the area has colonised, it or even whether the power supply’s been restored. But whatever the situation, I suspect that nobody who’s ever played on it would have any problem adapting to life on an outdoor squash court with no roof. Maybe it shouldn’t come as a surprise that one of the responsibilities of a squash coach – at least according to England Squash and Racketball – is to promote the concept of a balanced lifestyle which will support the well-being of squash players both inside and outside their sport. This appears to make a lot of sense even when you just consider the amount of time involved in, say, arranging and playing a couple of squash matches a week. Booking courts, finding partners, travelling, changing, warming up, warming down, sharing a drink after the match and so on. I once worked out that it took me five hours a week – and I lived within a ten minute walk of my squash club at the time! Then there’s the simple issue of a healthy diet. What’s good for you and what’s not? What should you eat or drink before playing – and when? And how should you schedule your meals and balance your intake on match days? Diet, of course, is just one thing you could think of as contributing to a balanced lifestyle. But if you consider your squash playing life – or, better still, all the things you do to feed your squash passion – you may begin to discover what you’ve already woven into the fabric of your lifestyle without even realising it. From the physical (exercise and sleeping are my particular favourites) to the social, from the mental to the spiritual, and last, but not least, to the material. Which, I suppose, could even include shopping for new squash clothing or a shiny new squash racket. So the next time you think about booking some squash coaching sessions, take some time to reflect on your current lifestyle and what it really means to you.